A new deal - Stowarzyszenie Młodzieżowych Inicjatyw Twórczych "CREATOR"
SMIT "CREATOR" members were participating in a partnership building activity titled A new deal is co-ordinated by Associazione TDM 2000 and held in Nurri, Sardinia, Italy. This partnership building activity will gather representatives from European youth organizations and will take place in the fall of 2012 in Nurri, in the Italian region of Sardinia, one particularly affected by the global youth employment crisis. Participating organizations are expected to devise solutions for the current situation and support the European strategies for boosting employability, remarkably to what regards “investing in skills training and anticipating future job requirements” such as the EC recommended in the recent Employment package of 19/04/2012. This autumn, from 12th to 18th of November I was attending in the Project Building Activity: “A new deal – networking for employability” organized by ASSOCIAZIONE TDM 2000 in Nurri, the small village in Sardinia, Italy. The PBA was founded by the Youth in Action Programme and gathered 26 young representatives from twelve European countries. Main aim was to create the strong synegria of cooperation between non-governmental organisations we represent. Participants were also going to work together on a silhouette of Youth in Action future projects which will be implemented in the near future. In the beginning, during the first day, after couple of hours of ice-breaking games, we were discussing and devising possible solutions for the current situation, which is the unemployment crisis in European Union. 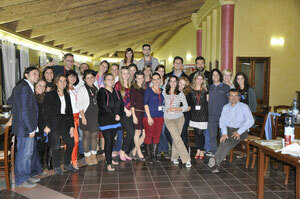 Traing Course or Youth Exchange can be valuable for their future career. Widening practical skills, taking part in workshops where unformal education is being used and focusing on personal entrepreneuership are in our opnion helpful hints. Day by day we had been collecting the knowledge about some governmental solutions for the unemployment problem in different countries. We were also sharing our personal experiences from the job market. During our debates with brainstorming and many other activities, when we were using unformal education methods, as for example team work, role playing etc., we had eventually discovered the most appropiate and needed topics for future projects. We are all convinced that European Union countries should emphasize the importance of youngster’s involvement into their own employability. Nowadays this is the one of the most important skill for everyone who wants to be independent and enterprising. The knowledge about how to write business plan and how to set up a new business is the key to make people braver and more enthusiastic about their own possibilities. It is extremaly important to change people’s way of thinking about the wide range of ways of getting a good job and overcome economical crisis. During this PBA I met a lot of energetic and involved young people who would like to change current reality and make our European environment much more safer and happier. We are all aware that without our commitment to the society and without active approach we cannot do much. The future of the European Union citizens is in our hands – by the participation in this project we took a great step forward to make a change!